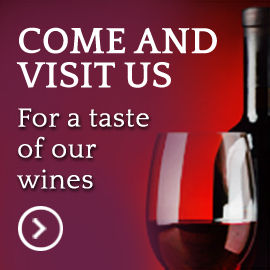 Vinification of red grapes:Once the grapes have reached the ideal degree of ripeness, they are placed in crates and taken to the winery straight away to avoid any undesired fermentation. At the winery the bunches are selected on conveyor belts and after removal of the stalks, the individual grapes are placed in small-sized tanks. 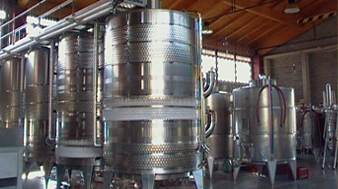 For still wines (Cabernet-Sauvignon and Merlot), alcoholic fermentation on the skins takes place for approximately 8-9 days, during which time the must is pumped over the grape dregs and wine-pressing takes place. After this fermentation, another maceration process on the skins takes place over several days, lending the product greater body and aroma. After this maceration process the racked off wine is placed in barriques made of French oak for 10-12 months. 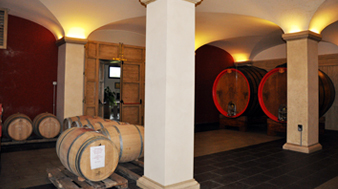 During the first 2-3 months malolactic fermentation takes place (the conversion of malic acid into lactic acid) takes place; in the ensuing months the wine becomes refined through the exchange of oxygen made possible by the porosity of the wood, taking on softer tannins and great aromatic complexity. For lambrusco, a sparkling wine, initial fermentation on the skins is followed by a second fermentation, for the prise de mousse whereby the wine takes on its effervescence, in pressurised steel tanks (autoclaves). The secondary fermentation is normally set off by the addition of stum, without other added sugars. Vinification with the Classic Method:The grapes are harvested slightly early in order to preserve the essential acidity needed to produce a base wine with the ideal freshness for being made into a sparkling product. After gentle pressing of the bunches, they are placed in steel vats at a controlled, steady temperature of 15° C for the first alcoholic fermentation. 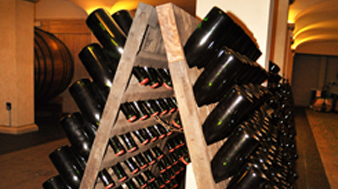 The secondary fermentation, for the prise de mousse that gives the wine its effervescence, takes place directly in the bottles, where the wine rests on the lees for at least 36 months before the final disgorgement (dégorgement) process. The prolonged resting on the lees, on the one hand favours a fine “perlage”, and on the other lends the wine a greater complexity, giving it a delicate aroma of “bread crust”. Vinification of white grapes:The grapes are harvested by hand, placed in crates and taken to the winery. Then they undergo a selection of the best bunches on conveyor belts in the winery. For still white wines the grapes are subjected to a gentle pressing in order to extract the must alone, which is then placed to ferment in steel vats at a controlled, steady temperature of 15° C, to maintain its primary aromas. For spumante – charmat method wines, the must selected at the first pressing is placed in pressurised tanks (autoclaves), where it rests on the lees for around six months in order to obtain good body and complex primary and secondary aromas.